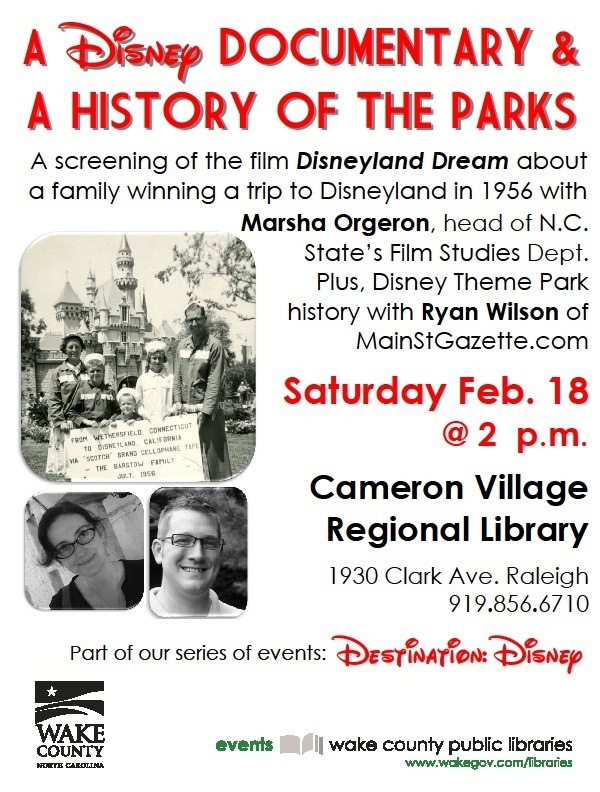 There are only three weeks left for planning your trip to Raleigh in order to see me talk about all things Disney Park history. Okay, so don’t actually plan a trip to Raleigh, NC just to come see me speak, however, if you are in the area, it would be great to see you! I promise to share as much knowledge as I can in the time they allot to me! Check the flyer for details. Passport to Dreams Old & New scribe, FoxxFur, has all that’s fit to print and more on the Golf Resort. Suzannah DiMarzio takes the family to dinner at Portobello and Zannaland readers get the review. Eating WDW and Sarah Holodick grab some sushi at Tokyo Dining. AJ Wolfe touches upon one of my favorite connection, the Disney name and wineries, at The Disney Food Blog. Rounding out the food section this week, Andy Jackson is not only Eating (and Drinking) around the World he’s finding new ways to drink around World Showcase. Mary Jo Collins has a breakdown of the Meet Up and Warm Up runDisney event held during marathon weekend over at WDW Fan Zone. Readers of the Disney Parks Blog got a dose of IllumiNations from years gone by from Nate Rasmussen. Makin' Memories and Melissa Loflin stick to Mickey's of Hollywood this week, this time looking at the shop's exterior. Matt Hochberg gives us his two cents on the Celebrity 5 and 10 at Studios Central.